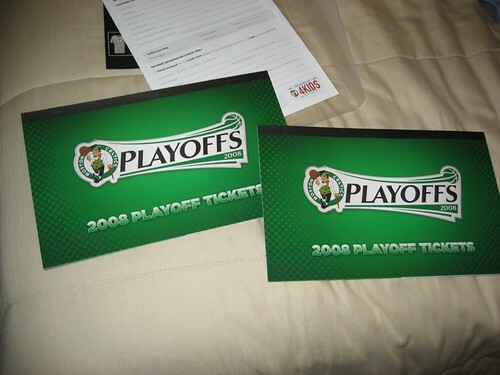 Yup those are my Celtics playoff tickets and nope you can’t have ’em! Actually, I may make a blog contest giving away tickets to one of the games if there’s a big demand, but I doubt it. It’s a great feeling to have the best basketball team of all-time back in the playoffs. Those are pretty sweet. I am looking forward to this contest if you decide to have it. We’ll see Justin. It’ll have to be a heck of a contest for me to give any of those away.